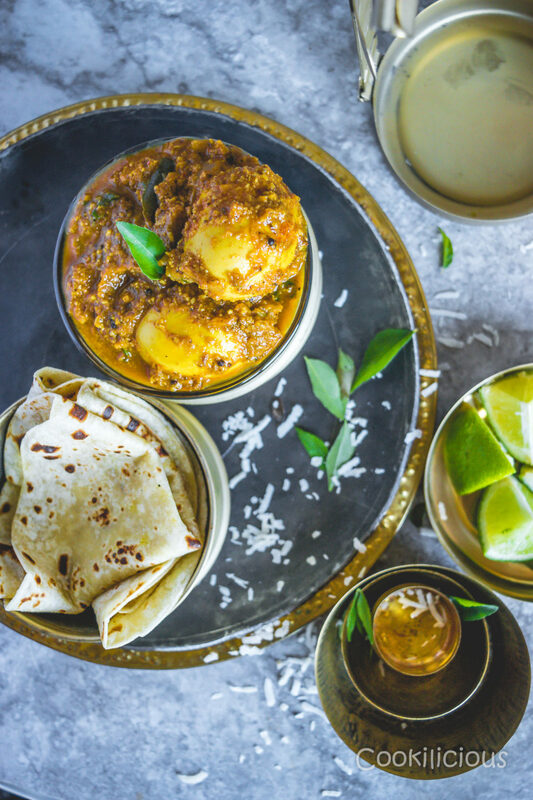 Chettinad Style Egg Roast Curry is a delicious spicy preparation of boiled eggs cooked in a delicious coconut, onion & tomato based gravy. An extremely flavorful and mouth-watering gravy that pairs well with steamed rice or any Indian bread. 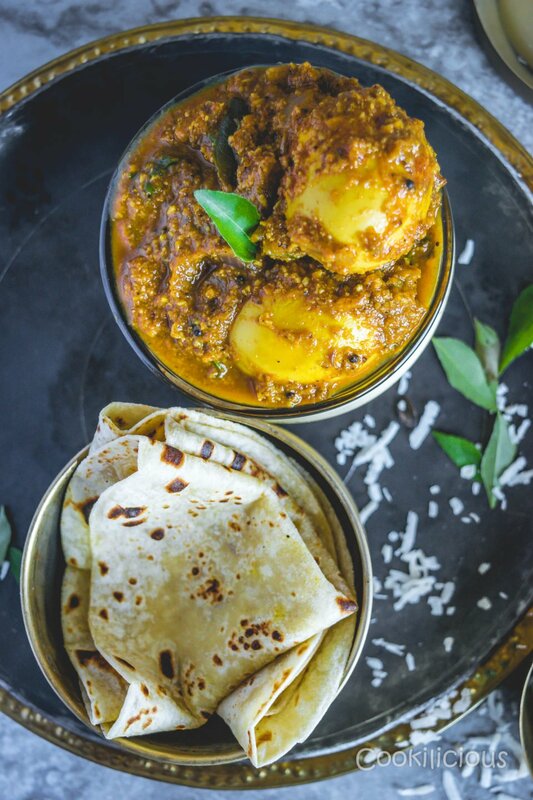 This egg curry is one of the famous ways to eat eggs in southern part of India. 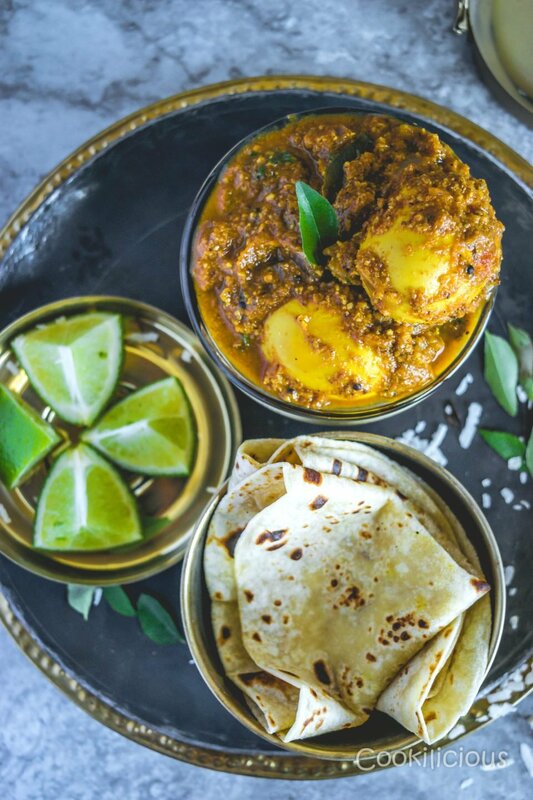 There is a saying in India which when translated sounds something like this, “This food is so well made that I would like to kiss the hands that made it!’ This phrase in Hindi has been used numerous times in movies, TV and even at homes. There have been a couple of occasions when it has been said for me as well but this occasion is one of my firsts where I said it to myself! Yes, after having prepared this Spicy Chettinad Style Egg Roast Curry, I said this to myself as a compliment! I was so overwhelmed and excited that I almost couldn’t believe that I had prepared this lip-smacking curry. I am a little stingy when it comes to self-appreciation, I prefer others do the talk when it comes to my food but this was one of those rare occasions where I just couldn’t stop myself. If you land up making this dish, you would know exactly what I mean. We had this dish for the first time at a newly opened Indian restaurant in our area. Both of us loved it so much that KR urged me to make it for him the following weekend. I must say that ever since we got back from the restaurant, it has been on my mind. I looked through Pinterest for recipes but I wanted to try a recipe more personal. So I decided to call one of my friend in India. Luckily for me, her grandma who is a great cook, was visiting and she gave me this recipe. I couldn’t thank her enough for handing me down a family recipe. This made it more special and worth my effort. I have to tell you here that even while I was cooking, I fell in love with this dish. The tantalizing aroma and the frequent tasting sessions were clearly not helping me finish the dish. It is indeed very rare that I feel so charged up about a recipe. It tasted so good that even the photography happened later with a more content belly and soul!
. Serve Spicy Chettinad Style Egg Roast Curry warm with some steamed rice or any Indian bread. 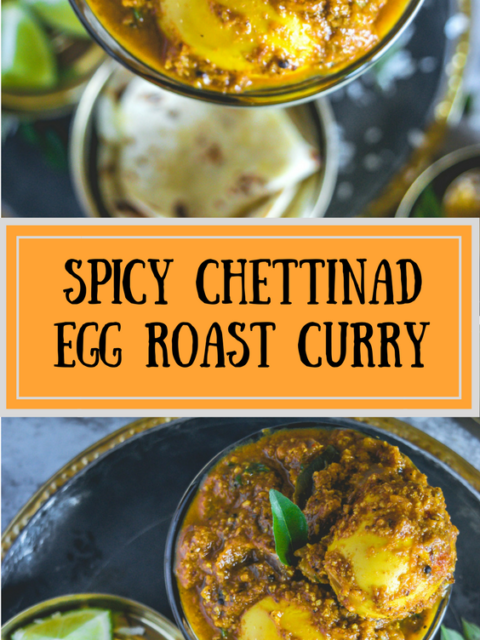 Spicy Chettinad Style Egg Roast Curry is such a dish that will be etched in your memory forever. Try it an any Indian restaurant you visit next time and see how it tastes. 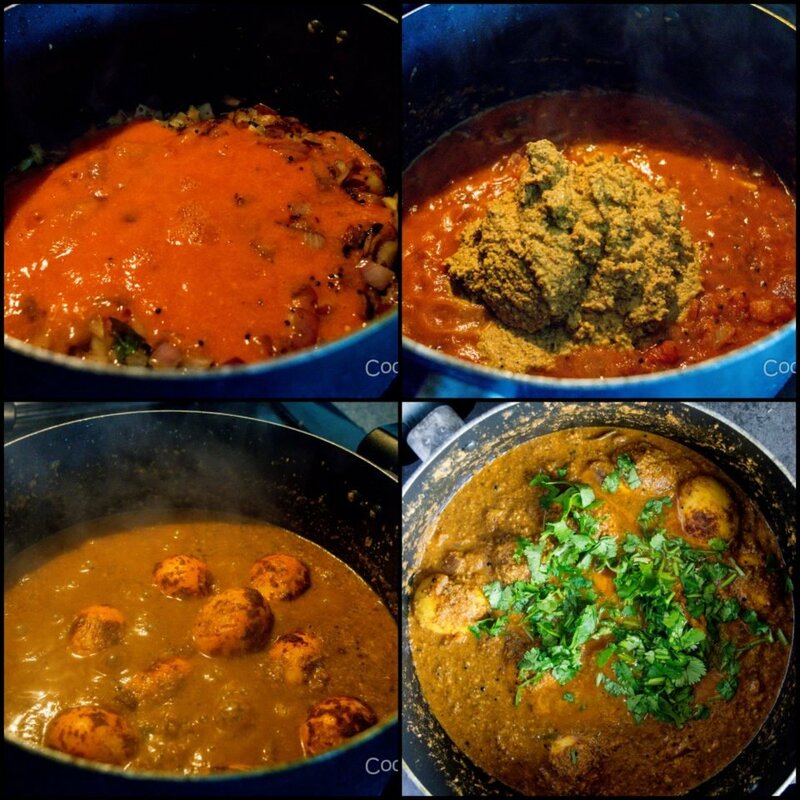 The coconut based gravy gives it the flavor and the masala blends wuth the egg so well, making this curry delicious. If you do try this recipe, please do share it with your friends on Facebook, Twitter and Pinterest. This will keep me motivated to develop more interesting recipes. 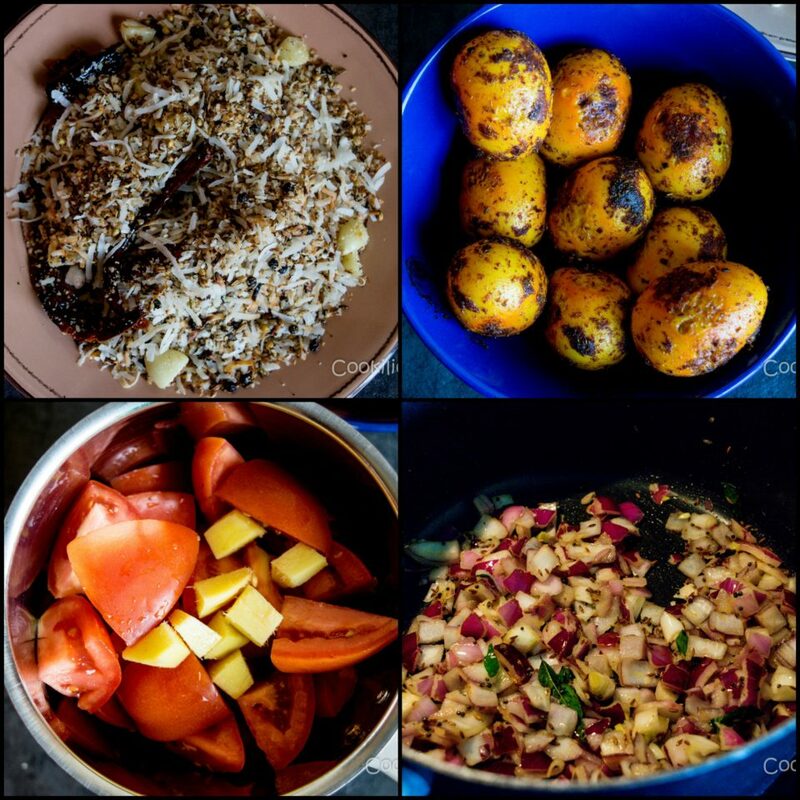 Click a pic and post it with the hashtag #cookiliciousveg . I would love to see your pictures on Instagram, Facebook and Twitter! 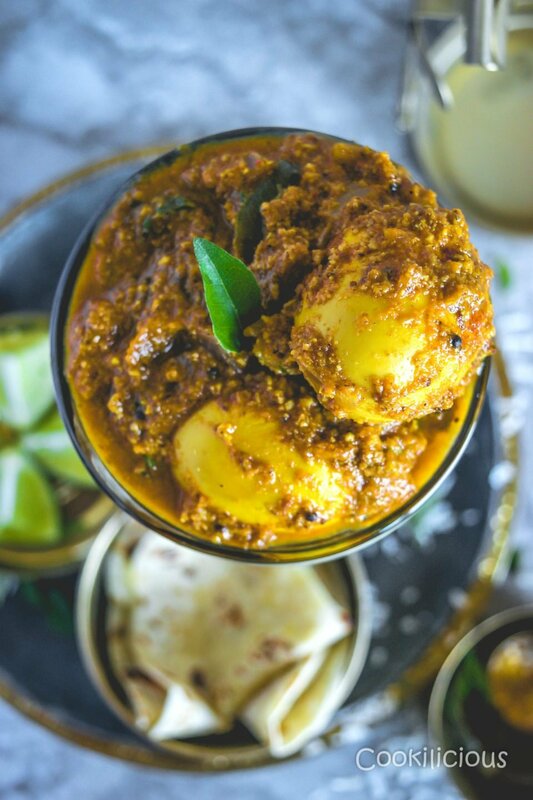 Chettinad Style Egg Roast Curry is a delicious spicy preparation of boiled eggs cooked in a delicious coconut, onion & tomato based gravy. An extremely flavorful and mouthwatering gravy that pairs well with steamed rice or any Indian bread. 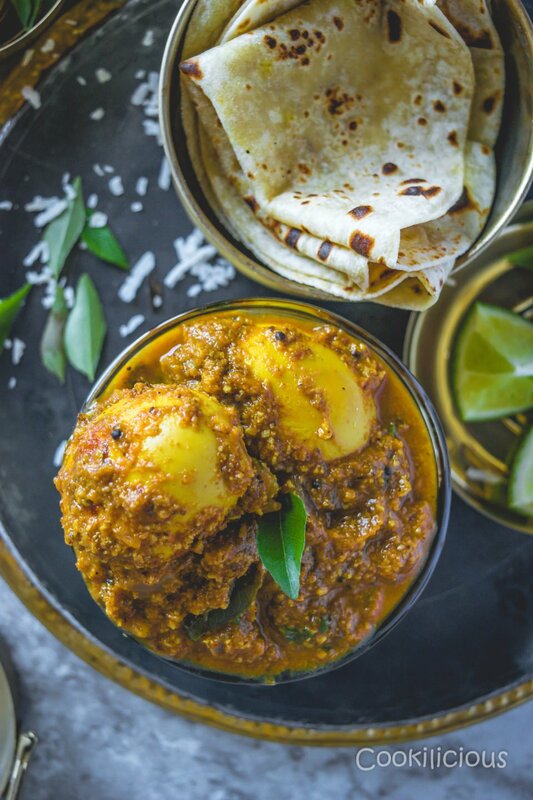 This egg curry is one of the famous ways to eat eggs in southern part of India. First boil eggs. Then we need to prepare the coconut base. For that, heat oil in a pan. Once its hot enough, fry cumin seeds, fennel seeds, coriander seeds, black peppercorns, garlic and dried red chillies. Fry them all for a minute. Then add grated coconut and continue to fry it for another 2 minutes. Transfer it to a plate and let it cool down. Then grind it to a smooth paste by adding enough water. In the same pan, heat oil and once its hot enough, add turmeric powder, chilly powder and coriander cumin powder. Fry for 30 seconds and add the boiled eggs to the pan. Coat the eggs with the masala carefully and fry them for 2 minutes. Transfer onto a plate. In the same grinder used before, blitz tomatoes and ginger to a smooth puree. Heat oil in the same pan you sued before. Once its hot, temper mustard seeds and cumin seeds. Once they crackle, add curry leaves and fry for 15 seconds. Then add chopped onions. Saute them till they turn translucent and then add the tomato ginger puree. Mix and cook for 5 minutes, covered. Then add turmeric powder, chilly powder and salt to the pan and continue to saute for another 2 minutes. Now add the coconut paste and fry this mixture for another 4-5 minutes, covered. Saute till the oil separates from the sides and then add the fried eggs to the pan. Coat the eggs with the masala and cook it for another 2 minutes. Garnish with chopped cilantro and lime juice. While we are vegetarians on most days, occasionally we crave for an egg based dish. Some of the recipes that I enjoy making are Tasty Veggie Frittata with Moroccan Seasoning, Egg Pepper Roast, Kerala Egg Puffs, Kolhapuri Green Masala Egg Curry, Eggs on Toast, Oriental Egg Fried Rice served with a Fried Egg and Egg Biryani. But I think I am going to be hooked onto this Spicy Chettinad Style Egg Roast Curry for a very long time now! It was really a delicious dish, and a nice experience with a new feather in my cap. Thank you so much.